Please join Amaro Bistro & Guardian Cellars/Newsprint Winery dinner on Wednesday, December 6th, 2017 at 6:00 PM. Our menu was created by Chef Nathan Luoma and all courses will be paired with wines from Newsprint and Guardian by Guardian Cellars. Join us for Seattle Restaurant Week during October 15th – November 2nd! This entry was posted in Blog on October 13, 2017 by Amaro Bistro. The versatile and affordable pasta has made its way into almost every American kitchen or it may even be safe to say that the average American has eaten some type of pasta at least once in a year. In fact, studies showed that the average American consumes 20 pounds of it annually. Pasta has long proved itself to be filling food, versatile, and easy to make. It mixes well with many ingredients and pairs well with a variant of sauces, protein foods and wines. But is pasta even healthy? Let’s look at this popular dish more closely. Pasta is carbohydrates, that is well established. Pasta is an all-around good source of carbs. The carb content of whole-grain and regular pastas vary, depending on the type. A cup of white spaghetti contains 43 grams of total carbohydrates, a cup of whole-wheat spaghetti offers 37 grams of the same. Recommended daily intake of carbs for the average person is 130 grams. A minimum intake of 250 grams per day is recommended as the body needs energy to function. Regular and whole-grain pasta are both sources of complex carbs, the type that digest slowly, which keeps energy levels on an even keel. Dietary fiber is a beneficial type of carbohydrate. It promotes digestive health and fights chronic diseases, like obesity and diabetes. Fiber does not get broken down by the body and so does not add to the sugar levels, passing out undigested. It actually subtracts from the total carbs ingested. And whole wheat pasta is a good source of it. Important minerals are also in pasta. The dish is an excellent source of selenium which activates antioxidant enzymes that protect cells from molecular damage. Manganese is another mineral that helps metabolize carbohydrates and regulate blood sugar. Whole-wheat pasta packs 1.9 milligrams of manganese, more than 100% of the daily intake for women and 83 percent for men. White pasta is a source of folate or vitamin B-9. Folate plays a role in red blood cell development and rapid cell growth. Whole-wheat pasta, on the other hand, is a source of the carotenoids lutein and zeaxanthin, minerals that support healthy vision. A diet rich in carotenoids also reduces the risk of lung cancer. What makes pasta more healthy? It is low in fat, low in sodium, great for dieting, and can be be available as gluten-free. You can’t really go wrong with pasta. If you’re in Bothell and craving pasta, know that we always serve a variety of this Italian classic from brunch to dinner. At Amaro Bistro, dining on our pasta is experiencing authentic Tuscan fare. This entry was posted in Blog and tagged Bothell Italian Restaurant on September 8, 2017 by Amaro Bistro. Join us for a wine dinner with Felsina Winery from Tuscany! This entry was posted in Blog on August 22, 2017 by Amaro Bistro. We’ve joined Amazon Restaurant! Delivery is now available exclusively for Amazon Prime members. Enjoy your favorite dishes at Amaro Bistro without leaving the office or house! This entry was posted in Blog and tagged Bothell Italian Restaurant on August 3, 2017 by Amaro Bistro. The gnocchi (pronounced nyok-ee) go way back to Roman times. They were made from semolina dough, mixed with eggs. Roman legions spread the dish throughout the the European region where they have conquered and it became a peasant delicacy as the gnocchi was inexpensive, easy to prepare, and filling. Gnocchi developed into different variations since then. At first they existed with different ingredients such as squash and breadcrumbs, made of ordinary wheat flour or cornmeal. Then they came with cheese and potatoes. But it didn’t become the potato dumplings we know today until the 16th century when potatoes were introduced to Europe. The potato gnocchi actually originated in Northern Italy, where the cooler climate was better suited for growing potatoes rather than grain. There are potatoes that are more starchy, that make light, airy dough and are responsible for the soft, pillowy texture and more potatoey flavor of the gnocchi. The most common way to prepare gnocchi today is to combine mashed potatoes with flour, forming balls of dough. The gnocchi dough is usually rolled out, then cut into small bite-sized pieces, each individually pressed with a fork or a cheese grater to produce the ridges on one side. The purpose of these grooves is to enable each dumpling to hold the sauce and taste more flavorful. But before that, the dumplings are quickly boiled in salted water in only a few minutes. The most popular sauce is light butter sauce with fresh sage. Though there are other methods and other sauces that make for delicious gnocchi, like extra virgin olive oil with small savory ingredients as toasted pine nuts, mushrooms or a touch of cream. There’s also gnocchi with sausage ragú, a traditional Sardinian dish. There’s baked gnocchi of cheeses and veggies with sausage, prosciutto or pancetta. There are tomato-based sauces, light cream sauce and pesto. Gnocchi is generally a first course dish, or an alternative to soups or other pasta. There are many variations – ricotta, spinach, pumpkin, and more. They are home-made in Italian households and found also in immigrant Italian families. There’s ready-to-eat gnocchi, produced in packages, and bought fresh or frozen in groceries and supermarkets. From humble beginnings, the gnocchi is now a world cuisine. Try Amaro Bistro’s housemade potato dumplings with sweet tomato sauce, Romano cream, basil and parmesan cheese. Our gnocchi variant is heavenly and truly authentic northern Italian cuisine. This entry was posted in Blog and tagged Bothell Italian Restaurant on July 7, 2017 by Amaro Bistro. We will be open from 10:00 AM – 3:00 PM on the 4th of July for brunch. This entry was posted in Blog and tagged Bothell Italian Restaurant on June 26, 2017 by Amaro Bistro. Dine and enjoy the sunshine out on the patio at Amaro Bistro! This entry was posted in Blog on May 30, 2017 by Amaro Bistro. 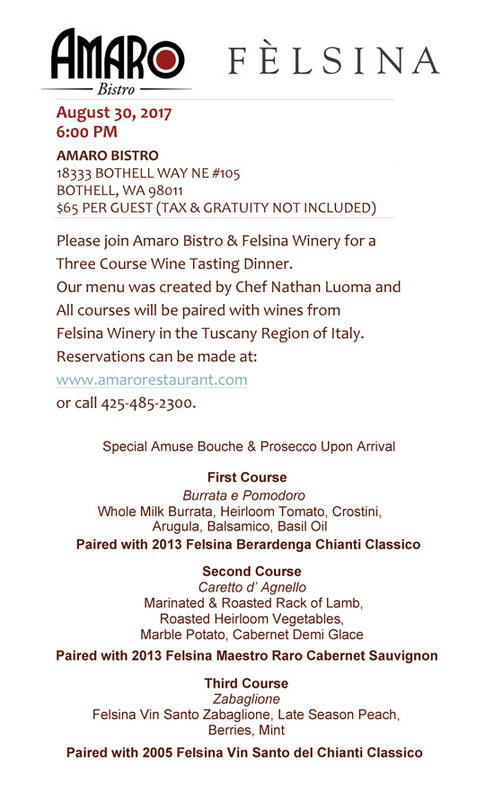 Join us for Mother’s Day, Sunday, May 14th, at Amaro Bistro! Spots are filling up quickly, so make your reservations today! This entry was posted in Blog on May 8, 2017 by Amaro Bistro.